Death was ‘always present, cosily accepted’ in Robin Dalton’s 1930s childhood in Kings Cross, Sydney. As a single child in a house full of eccentrics, the fairy tales she was told were the amusing accounts of how her relatives met their ends. 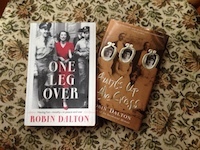 Dalton’s Aunts up the Cross is still in print, I’m happy to see – originally Penguin and now a Text Classic – and it would make a great Christmas present. There is not a word wasted, every word is elegant, and nearly every word is funny. Clive James in his Foreword calls it a ‘perfect book’. It is exhilarating. Dalton’s buoyant characters and the incidents she describes in her simple, direct style will make you laugh aloud. The author’s family lived in a large terrace house precisely where Kings Cross railway station is now. Her father was a doctor whom Robin accompanied on his rounds. As a child she witnessed encounters with some serious and some comical patients, leaving indelible impressions of human nature on her mind. Dalton speculates that ‘it was the clash and mingling of the Irish and Jewish temperaments which produced this climate of high dramatic comedy. She recalls that the twin themes dominating the house – death and the lack of privacy – ‘merged and culminated in the unhappy event of [her] mother killing the plumber’. Emerging naked from her bedroom, on her way to the bathroom, she encountered the plumber on the landing above the stairs. He died of a heart attack. Aunts up the Cross is an enchanting little book, brimming with wit and warmth. There are other books: this first perfect one, and An Incidental Memoir (Penguin, 1999) plus the new One Leg Over (Text). Text have also previously published her Dead is a 4-letter Word and My Relations. I haven’t read the last two – good news: two more of her books to anticipate. An Incidental Memoir is an entertaining account of a fascinating life. Dalton, born in 1920, had the knack of being in the right place at the right time, as well as being blessed with high intelligence and many gifts. At eighteen she married a charming alcoholic. After her divorce she travelled to London where there was an endless string of admirers and frequent trips to Paris to shop for hats. She spent time with the Kennedy clan on holiday at Cannes, going to parties and sampling the sort of decadence where fountains played champagne instead of water. The young John F. Kennedy, meant to be taking the author home, drank too much and fell into one of the fountains, where, we can safely assume, he unavoidably drank yet more. Maturity came when she met the man who was to become her second husband. He was a brilliant doctor. They had two children. When the children were still small, her husband died of a heart illness. She writes about this tragedy in An Incidental Memoir and in the new book, One Leg Over. Each memoir can be read independently and although some cover some of the same events there is never the impression of repetition. The author gains maturity and a different perspective with each book, enabling her to share new insights into her past. Later in life, Robin Dalton had a very happy third marriage, to playwright, screenwriter and novelist Bill Fairchild. Her professions ranged from journalism to acting in TV ads, from being a literary agent to being recruited as a spy, and finally producing films. My favourite of her films is the one adapted and directed by Michael Blakemore – a version of Uncle Vanya set in Australia, called Country Life. The making of this film puts new meaning into the concept of suffering for art – and I’m grateful they did because the film is a masterpiece. Nearly twenty years later, Dalton’s equanimity has not diminished. Her spirits remain buoyant and her wit lively. She writes, ‘After Bill’s death, my working years over, the romance-filled years gone, at ninety-five I still feel the benefits of being a woman …’ Read One Leg Over to find out what they are. I won’t spoil her last words either, where she explains what the title means.